Fire your pay TV provider! Yes, I’m referring to your unfriendly local cable TV company, your satellite dish TV provider, and the like. Most of these companies have atrocious customer service, they gouge you with ridiculous or hidden fees, and they continue to hike the price of TV subscription packages year after year with no end in sight. If you can’t break your TV addiction and you don’t want to continue shelling out your hard-earned loot, it’s time to consider installing an HDTV antenna! Most people aren’t even aware that you can get absolutely free, high definition broadcast television channels over the air (OTA) with a modern HDTV antenna. To dive into this brave new world of free HDTV, you’ll need proximity to a major metropolitan area that has broadcast television towers and you’ll need to be in the receiving path of the signals. I’ve used my HDTV antenna in the Phoenix Arizona area and the Salt Lake City Utah area, at 3 separate homes. One of the first things you can do is to hop on over to AntennaWeb.org and punch in your home’s address. In the screen grab below, you can see the AntennaWeb.org results from Bountiful, UT. Click on the image for a larger view. 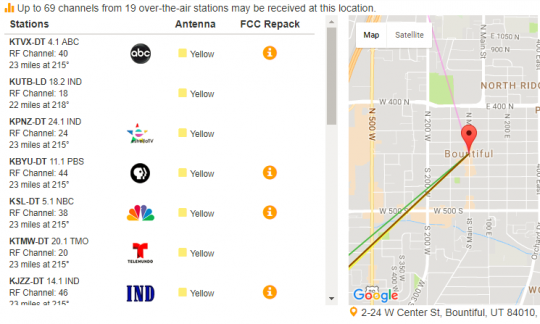 From this location, AntennaWeb reports that there are up to 69 channels available from 19 over-the-air tv stations (broadcast towers). The vast majority of those stations are south-west of the location, at approximately 215°. Naturally, this will vary by address. You’ll want to take down what direction and degrees the stations are in relation to your home, so that you can point your antenna in the appropriate direction at install time. You don’t have to be absolutely precise with the direction that you point your antenna, as the broadcast towers cast a wide signal and these signals do bounce off buildings and other objects. It does help to point it directly at the source though, so personally, I do try to be as precise as possible when installing an antenna. You can accurately position your antenna with the help of a compass. On the AntennaWeb results page, you’ll also notice that each station has a color specified in the Antenna column. This color coding indicates what type of antenna and how powerful it needs to be in order to receive the signal for that station, for your particular location. If you’re in a major metropolitan area, you can likely buy the necessary rooftop antenna for $40 or less. The antenna that you buy doesn’t have to be the same shape as the one pictured in the photos of this article, just check out the reviews and get one that has decent marks from its purchasers. Don’t go overboard, you likely just need one of the little moderately priced ones, not a massive and expensive model that you might buy if you lived 60 miles from a broadcast tower. Once you’ve purchased your antenna and are ready to install it, you’ll need a mounting pole. Fortunately, most houses nowadays have an old satellite dish or an old analog antenna just sitting there on the roof, ready to be removed. 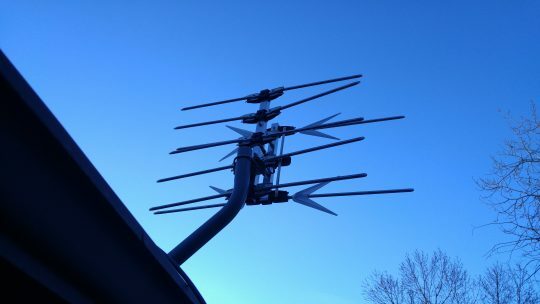 If you can, remove that old satellite dish and re-purpose its mounting pole for your fancy new over-the-air HDTV antenna. 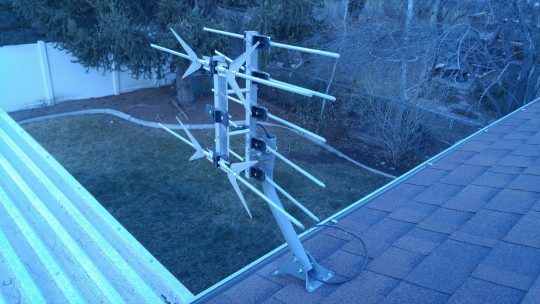 If you don’t have an old dish or an old antenna on your roof, you’ll need to buy a mounting pole for less than $20. You can then either mount it to the roof or to a wooden beam of the roof awning. You’ll want to be strategic with where you place your mounting pole and antenna on your roof. Factors that come into play include the direction of the broadcast towers you will be pointing towards, the location of the coaxial cables / junctions inside your home, and any structures or objects that might block or hinder your ability to receive the broadcast signals. If I’m mounting a new pole, I tend to do it near the same location where either cable TV or satellite TV was previously run into the house. This allows me to co-opt the old cabling and use it for the over-the-air HDTV, with minimal adjustment to the home’s existing cable runs, splits, etc. Once your mounting pole is installed (or re-purposed), mount your new HDTV antenna to the pole and either point it in the general direction of the broadcast towers or use a compass to get a more precise positioning. Getting precise should help to ensure maximum signal receipt. With the antenna in place, you can now screw on your coaxial cable and feed it down into your home, if you’re not using a cable that was already run into the interior. In my next post, I’ll discuss internal cable runs, using an amplifier, scanning for channels with digital TV tuners, my channel results, and more.